View of “In the Good Name of the Company,” 2013. The house style of LA’s Colby Poster Company (1946–2012)—hand-set Times Gothic and Railroad Gothic type on Day-Glo fluorescent backdrops in two standard size sheets—has become a local landscape fixture. The company’s letterpress and silk-screen prints provided (and inspired) ubiquitous outdoor advertising for punk bands and carnivals as well as website designers and Nigerian politicians. Artists, too, regularly employed the iconic signage, perhaps most famously Allen Ruppersberg in his Howl-quoting The Singing Posters, 2003; more recently, the Hammer Museum used it to brand its 2012 “Made in L.A.” biennial. The current exhibition, a greatest-hits collection and de facto memorial, assembles work from both the pragmatic and poetic sides of Colby’s history, just two months after the company shut its doors. Nearly three hundred posters, including selections from the Colby archive and collaborations with twenty-seven named artists, are displayed as a tight, irregular grid of signs hanging from binder clips. 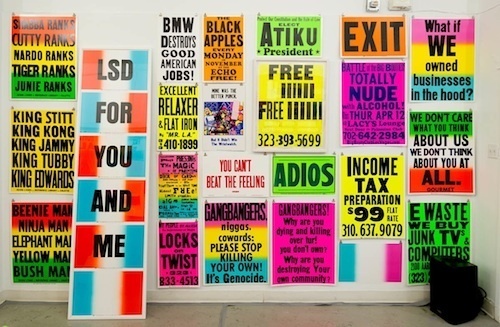 In such a maximalist presentation, several of the text-heavy artists’ posters seem best suited for telephone poles and chain link fences, as isolated interventions asserting their witticisms and literary appropriations to dulled car-seat viewers. The contributions that stand out here intervene in the compositional space of the Colby design, such as Emilie Halpern’s two-sided Valentine, 2012, and the asterisk-like Black Suns/Black Holes from Inner Experience by George Bataille, 2010, by Scott Benzel, who also augments the indoor/outdoor dynamic with an audible street sound composition, Quartet 2, 2011. Peter Coffin’s untitled 2008 series of poster blanks, each a different three-color atmospheric fade, neatly casts the Colby backdrop as a dose of Los Angeles skyspace.